I’ve been doing a lot of research into creating Spacetrawler entirely on the computer. Aside from the 1k price on a Cintiq, I simply can’t figure out a way to not make it look as hand-drawn on a computer in the same way it looks now. And although I have no strong feelings on what a comic should look like, I do feel strongly in my own work that whatever it DOES look like — it should remain as consistent as possible throughout the project. Who knows if I’ll manage to achieve that before the project is over, but it’s still been fun to play with Cintiqs and photoshop filters. On the comics front, I’ve been really enjoying Scott Kurtz’s delve back into his archive of characters to retrieve the lovely Sonya Powers. I remember her well from her first run back in 2002, awww, poor Skull. Hey, just a heads up. 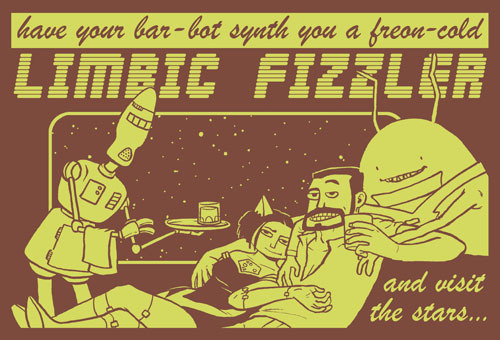 TopatoCo and I are discontinuing the Limbic Fizzler tee, so get ’em while supplies last! Emily is not the coy type. I feel very Martina-ish right now. 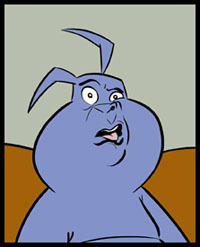 Thought 2) I know of no other webcomic to give me plot whiplash so often as SpaceTrawler. Well, I guess all I needed was the threat of not being able to buy the limbic fizzler t-shirt to get me to *buy* the limbic fizzler t-shirt! I just wish you had more spacetrawler items in your shop. How does Kuu-Drahc make his tentacle fist go “SLAM!” ? Shouldn’t it be “SLQSHH!” or something? @Nick, the “SLAM” sound comes from Kuu-Drahc slamming the (specially reinforced) head of one of his minions into the desk/wall/floor/whatever. Said minions are chosen specifically for this task based on the satisfactory noise they make when striking the object and how many slams they can take before being replaced. Wait — did Emily just start monologuing? I thought only bad guys/evil villians did that. Scary-Go-Round (viz: http://www.scarygoround.com/sgr/ ) started off as computer-done, then John A. did it by hand for a while (chapters 24 & 25), then went back to computer-done, then went back-back to hand-done (chapter 31), which he’s stuck through up to current day. Although I don’t dislike the hand-done ones, I personally prefer the computer-done look. There’s also Tweep (viz: http://www.tweep.com/ ) which I’m quite sure is computer-done. But much like with SGR, it took a while to develop (if you check some of the latest episodes, then skip back to the first ones, it’s a startling leap back to the artist getting used to the medium). @Susan, what kind of things? What would be interesting would be to do two version of the panels; one ‘manual’ and one ‘automatic’, and then see which seems to be working out. That way, one can experiment with the computer-drawn ones without it being the only option. Obviously though, this means twice the work on your part. I’ve seen folks occasionally dabble with mixed styles in meta-ways. One thing a friend of my brother’s was working on involved a different artist for each alien race, to add to the “these things aren’t like the other things” feel. A few other folks have used a different style for flashbacks or other internal narrative bits, and I could imagine it being cute to use computer-drawn for things that are on monitors. Of course, it’s hard to introduce such a thing mid-stream, and a bit annoying to go back and retroactively preserve continuity by re-doing every monitor screen we’ve seen. @YoungWilliam, actually, the thing right now is that I can’t justify buying a Cintiq unless I’m actually going to use it for this. But to truly know if it’d work, I’d need to have a Cintiq. One of those dreadful loops. Gunnerkrigg Court also switched from being drawn on paper to being drawn entirely on the computer. (Like you, Tom Siddell colored on the computer even back when he was inking on paper.) In that case, however, Tom has constantly been trying to improve how he draws, and he wants to look good more than he wants to look consistent, so the switch from paper to computer (which happened somewhere shortly after this page in the archives) was actually less noticeable than some of his other, completely unrelated artwork changes. Is Emily supposed to be saying “I’ll see you at Broghams teeth, spaghetti fingers”? It’s been spelled “Brograhm’s Teeth” on other pages. Wouldn’t it be funny if they simply Didn’t Go to the Teeth, or took the scenic route, why they’d be scot free for quite a while.